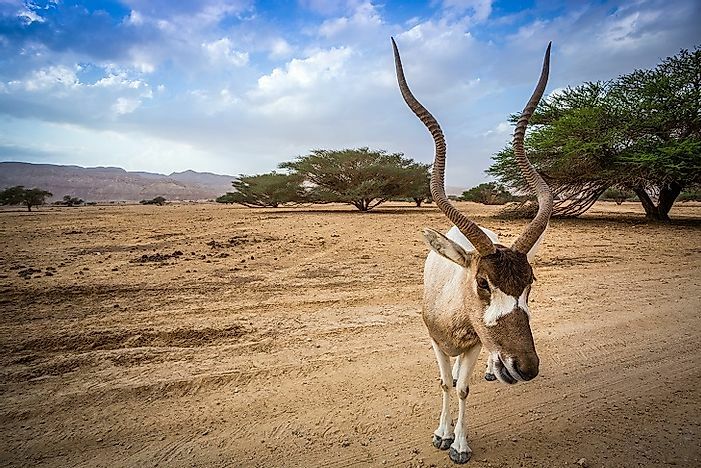 These antelopes, once abundant in the Sahara, are now on the brink of extinction. A lone Addax antelope amidst the harsh desert environs it calls home. A critically endangered antelope species, the addax antelope is currently on the brink of extinction with only three individuals of this species remaining in the wild in Niger as per reports from the International Union for the Conservation of Nature (IUCN). These antelopes have an average length of around 150 to 170 centimeters with females being smaller in size than males. The males weigh around 99 to 124 kilograms, and females weigh around 60 to 125 kilograms. The color of the addax antelopes varies between summer and winter. In summer, they adorn a whitish or sandy beige-colored coat which helps reflect off the heat in the hot desert weather and in winter their coat color changes to a grayish brown while their hind parts and legs remain white. The addax antelope also has a pair of twisted horns with ring-shaped ridges in the lower and middle parts, a tuft of black hair stretching from the base of their horns to between their eyes from where a white-colored patch forms an X-shaped form till the middle of their cheek. They also possess a patch of brown hair on the forehead that extends for a short distance down the neck, and sturdy legs and flat hooves that stabilizes them in the sandy terrain of the desert landscape. The addax antelopes are herbivorous in nature where they feed extensively on desert vegetation like herbs, grasses, and bushes. They feed on leaves, shoots, seeds, and other plant parts. Parnicum grass is one of the most favored food sources of addax antelopes, and these species feed only on the seeds and shoots of these plants. Water requirement of this species is also low as the animals obtain their water primarily from the plant sources they consume. The addax antelopes live in herds of 5 to 20 animals led by a dominant male and prefer to stay in a single habitat or wander around to other areas. These antelopes also prefer to inhabit areas with relatively higher rainfall levels so that they can obtain a greater source of food in such areas. The addax antelope inhabits range in the stony and sandy deserts of the world as well as semi-desert and dry steppe regions. They were once widespread over large areas of the Sahel and Saharan regions of Africa west of the Nile and were present in nearly all the countries lying within the confines of the Sahara Desert. However, they have completely gone extinct in most of these countries such as Egypt, Sudan, and Libya, and the current population of these antelopes is highly reduced and confined to only the Termit Massif Reserve in Niger. There are also reports of sightings of these antelopes in other parts of Niger, Chad, and some other parts of Africa. The addax antelopes are one of the most threatened species of the world today with populations nearly on the verge of extinction. Hunting for their skin and meat over the centuries has been one of the prime reasons behind their present threatened status. Other factors include roadway kills, loss of habitat to human settlements who inhabit the waterholes where the antelopes feed during the dry season, and increased desertification and resultant droughts. Though wild populations of this species is nearly completely decimated, some captive-bred populations are found in the Middle East and the United States. The antelopes have been provided significant protection in many African countries but the lack of sufficient funds to allocate towards the protection of these species has led to the loss of these species and their extinction in many countries despite their protected status under the legal framework of those countries. These antelopes have been reintroduced in Tunisia and Morocco. The male addax antelopes are sexually mature by the age of 2 while females mature at the age of 2 to 3. Breeding occurs throughout the year but peaks towards the end of winter and beginning of spring each year. The gestation period of this species is around 9 months and only a single calf is born at the end of the gestation period. The calves are around 5 kilograms in weight and depend on the mother’s milk for about 23 to 29 weeks since birth. These antelopes survive for about 19 years in the wild. What Was The Sahara Before It Was A Desert?